We’re over the moon to have launched our very special Keepsake Jewellery page on our website. This has been a long while coming and we’re so excited to final specialise in all those sentimental, bespoke commissions, made from your beach finds. Due to popular demand we are happy to now offer this unique service to our customers. It’s something we’ve done previously on the quiet but having discovered just how precious these items are to our clients and just how much of a pleasure it is for us to be creating these, we wanted to shout a little louder about our capabilities! We think what we do is pretty special. We can take your smooth stones, your precious pebbles, your rough rocks or gorgeous beach glass and transform into something completely unique! We will work together with you to create something perfectly precious to just you (or your loved one). By doing this we are able to timelessly capture your beach find in a sentimental piece of jewellery for you (or a loved one) to wear and enjoy for many years to come. Our commission process can take between 4-8 weeks and cost from £175 upwards. Timescales and costs will be dependent on complexity of design, current work load and materials used. Once we know a little more about what you have in mind, we can give you an estimate of likely costs and timescale. We will gladly guide you through each step and answer any questions you may have. We truly care about your commission with both our ears for listening and our hands for making. We will always do all we can to create a keepsake that reminds you of that precious moment, that special person or perhaps that memorable place. 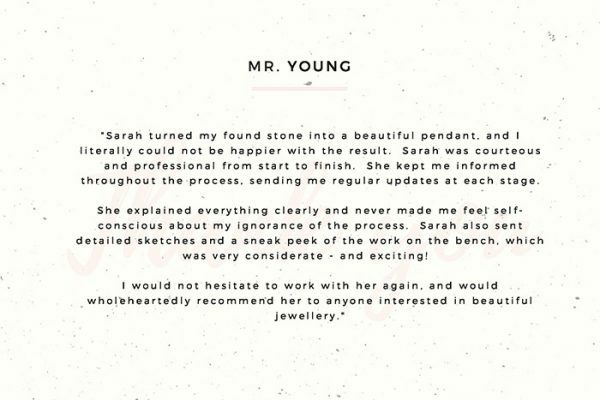 But don’t just take our word for it, take a look at what some recent clients said about their experience having their beach find jewellery made below. 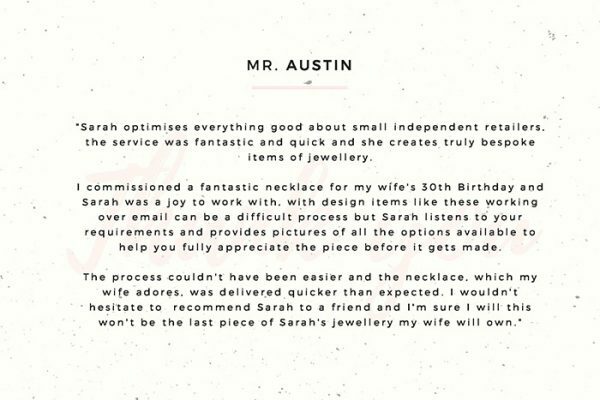 If this sounds like our new Beach Find Jewellery service is just what you’ve been after, find out more information below and get in touch.